This spicier, creamy all-natural vegetarian sauce is the base for many popular Indian classics. 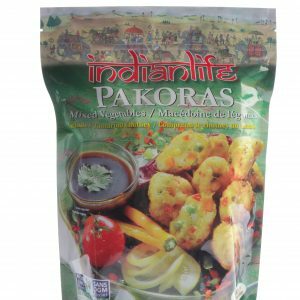 Enjoy its versatile flavor with cooked chickpeas, paneer (Indian cheese), tofu, pasta, vegetables and more. Water, tomatoes, milk, cream, tomato paste, onions, canola oil, butter, yogurt, salt, evaporated cane juice, almonds, garlic, ginger, red chili powder, citric acid (acidulant) fenugreek leaves, turmeric, cumin, coriander powder, cinnamon, cloves, cardamom, black pepper, bay leaves, mustard seeds, mace. Heat 1-2 tablespoons of vegetable oil in a frypan over medium heat. Sauté 2 cups 1 ½ lbs of vegetables or your desired ingredients. Add 10 oz of water and cook for 5 minutes. Reduce heat and add sauce and simmer for 10 -15 minutes or until ingredients are cooked. 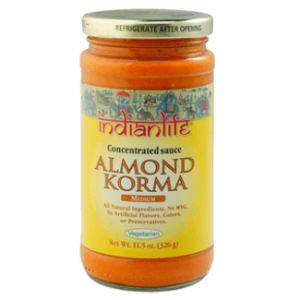 Garnish with cilantro and serve with warm rice and Indianlife naan or roti. Chefs tip: For spicier taste, add ¼ to ½ tsp. red crushed chili powder. Serves 4 -5 SHAKE WELL BEFORE USE. (Product separates naturally.) Once opened keep refrigerated and use within 3 days as there are no preservatives. 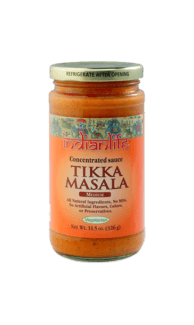 Tikka Masala Recipe: Heat 1-2 tablespoons of vegetable oil in a frypan over medium heat. Sauté 2 cups 1 ½ lbs of vegetables or your desired ingredients. Add 10 oz of water and cook for 5 minutes. Reduce heat and add sauce and simmer for 10 -15 minutes or until ingredients are cooked. Garnish with cilantro and serve with warm rice and Indianlife naan or roti. Chefs tip: For spicier taste, add ¼ to ½ tsp. red crushed chili powder. Serves 4 -5 SHAKE WELL BEFORE USE. (Product separates naturally.) 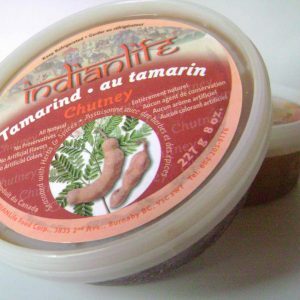 Once opened keep refrigerated and use within 3 days as there are no preservatives.